The Varangian Guard in Byzantium is one of the very few mercenary units whose history can be counted in centuries. The length of their service and the number of battles in which they fought is perhaps only surpassed by the Swiss in the pay of the French. But while the Swiss had only to journey into neighboring France, in times when there were already well-established and regular postal routes and diplomatic missions, the Norsemen had to travel far beyond the boundaries of their known world. From the point of view of the Byzantines, these Norsemen came from a distant land, Thule, told of only in myths and legends. 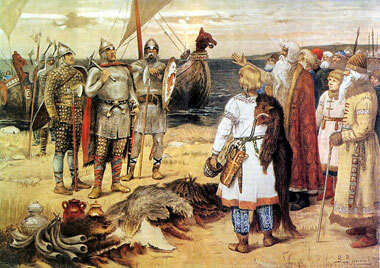 By the 9th Century, Swedish Vikings had travelled along the great rivers into modern-day Russia. They came as traders or as raiders, depending on how they calculated their chances of making profit. They quickly constructed their first fortified trading posts and began subduing the local population. By 850 they had founded their own principalities in Novgorod and Kiev, and the small ruling elite which they managed to form intermarried with Slavic noble families to consolidate their power. The Slavs called the Norsemen "Rus" and soon the word became synonymous for the whole realm united under the leadership of Kiev. The name "Varangian" was also often used, which meant a stranger who had taken military service, or a man who belonged to a union of traders and warriors. 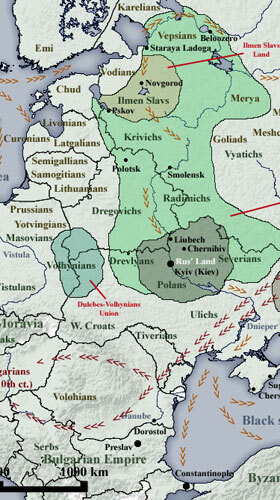 Though sometimes both terms were used interchangeably, it became common to use "Rus" as a designation for the established Nordic Slavic nobility who reigned in eastern Europe, while "Varangian" was used for the foreign warriors still arriving from Scandinavia to trade, or offer their swords for hire to the Rus. In their wars and internal feuds the princes of the Rus preferred to recruit new fighters from the north, which was facilitated by existing trade routes and old alliances. Since the Rus came originally as traders and pirates, it was natural that they pushed further down the Dnieper from Kiev. They reached the Black Sea, crossed it and discovered in the riches of Constantinople the true object of their desires. 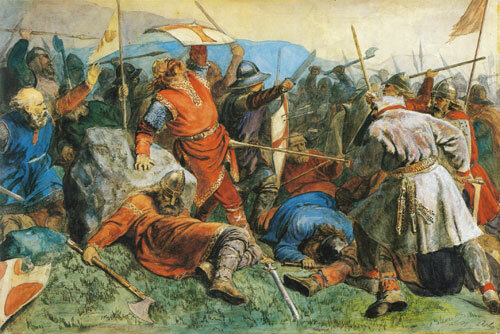 Already by 860 they had made their first attack, followed by others until the last great assault in 1043. But between these unsuccessful attacks the Kievan princes traded with Byzantium, married Byzantine princesses and supplied the Byzantines with mercenaries. It is therefore unsurprising that the sources mention "Russian" mercenaries in Byzantine service even more than they do the numerous Russian raids in the area. This was in the best Viking tradition: if you couldn't conquer your opponent, you traded with him or took his money as a mercenary. In Byzantium the Varangians encountered the only state in medieval Europe whose fiscal organisation permitted regular paying of mercenaries. Besides troops, which were provided by the military districts, the so-called "themes" or "themata", the Byzantines routinely contracted foreigners: Normans, Hungarians, Turks, Lombards, Georgians, Armenians, Arabs, Slavs and many others. 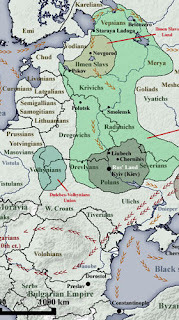 The first Rus mercenaries are mentioned in 902 as part of an expedition to Crete. Since the recorded names are all of Nordic origin, it can be assumed that this 700-strong auxiliary force consisted mainly of Varangians. More followed and it appears that the Varangians soon became an integral part of the multi-ethnic conglomerate of the Byzantine army. As a result of internal fights in Kiev the Varagians became firmly established in Byzantium. There Vladimir the youngest of three brothers and pretenders to the throne was forced to flee "across the sea", meaning to Scandinavia. But with the aid of a relative he was able to recruit numerous Varangians who helped him conquer the throne of Kiev. After that he was apparently confronted with the problem that he could not pay his allies, who nonetheless showed little desire to return to their homes. It is said that they impetuously demanded to be shown the way to "Miklagard", as the fabulous Constantinople was called in Scandinavia. It was probably a relief, then, when Basisl II, emperor of Byzantium, asked for military assistance to suppress some serious rebellions. Vladimir sent 6,000 of his restless, quarrelsome warriors to Basil, who was able to consolidate his power with their help. From then on, the Varangians, or the "axe-bearing barbarians", formed the core of the Imperial Bodyguard. In the following years the Varangians fought in Syria, Armenia and Sicily. Not all arriving Norsemen entered the Imperial Guard automatically however. This was a very exclusive unit, whose members received higher pay, could be among the first to loot after a victory, and even had the privilege of plundering the emperor's palace after his death. Moreover, one can well imagine that the Byzantine court offered other important sources of income for people who could possibly reach the Emperor's ear. Positions in the Guard were therefore sold for good money, and many newcomers from Scandinavia served in other units until they had collected the necessary capital. In battle the Guard proved itself again and again, quickly earning a reputation for being the elite of the Byzantine army. Thus a Byzantine chronicler tells of the fighting in southern Italy in 1018 against Lombards and Normans: "When the Emperor learned that brave knights had invaded his country, he sent his best soldiers against them. In the first three battles the Normans were victorious. But when they encountered the Rus, they were defeated and their army was completely destroyed." In the Battle of Beroe (1122) against the Pechenegs, when all other troops had failed to break the circled wagon train of the Pechenegs, the officers cried finally for the "Emperor's wineskins", as the guardsmen were sometimes called due to their habit of heavy drinking. Although heavily outnumbered they broke the circle and slaughtered numerous enemies. They were especially appreciated, however, for their loyalty. According to Anna Comnena, the Greek princess and a major source of information regarding Byzantine history, they passed down this loyalty from generation to generation almost like a sacred heritage. As foreigners, they didn't have much to do with the cabals and intrigues at the Byzantine court. In addition, they were probably brought up from childhood to be loyal and faithful to those who paid and rewarded them. And of course one should not underestimate the exotic charm of a Guard of such barbaric giants with their foreign weaponry amidst the highly ceremonial Byzantine court. Even the Roman Emperors Caligula and Nero kept a Germanic guard, which they appreciated for courage, loyalty and above all, height. When the Varangians had become a permanent institution, the connections between Scandinavia and Byzantium proved ideal for the recruitment of mercenaries. On the one hand there was the rich empire with its constant need for reliable troops, and on the other the poor rural regions of Scandanavia where the warlike population was looking all over Northern Europe for ways to make their fortune. The Varangians from Sweden were soon joined by those from Denmark and Norway. Some even made their way from distant Iceland. A number of inscriptions on runestones in Scandinavia bear testament to the fate of these lost sons. One reads, for example: "In memory of Folkbjôrn who died in Greece"; and another: "Raised by Vefar in memory of her brother, who died in Arabia." Fewer, however, record the good fortune of those like a certain Mursi: "He made a lot of money for his heirs in Greece." Nevertheless it seems that those who returned with a fortune were the best advertisement for new recruits seeking to enlist. So the Icelandic Laxdaela Saga tells of a certain Bolli Bollason who went to Byzantium and there climbed the ranks to become an officer of the Varangian Guard. His homecoming in 1030 is described in the following way: "Bolli brought back with him much wealth, and many precious things that lords abroad had given him. Bolli was so great a man for show when he came back from this journey that he would wear no clothes but those made of scarlet and fur, and all his weapons were bedight with gold: he was called Bolli the Great. [...] Bolli rode from the ship with twelve men, and all his followers were dressed in scarlet, and rode on gilt saddles, and all were a trusty band, though Bolli was peerless among them. He had on the clothes of fur which the Garth-king (Emperor) had given him, he had over all a scarlet cape; and he had Footbiter girt on him, the hilt of which was dight with gold, and the grip woven with gold; he had a gilded helmet on his head, and a red shield on his flank, with a knight painted on it in gold. He had a dagger in his hand, as is the custom in foreign lands; and whenever they took quarters the women paid heed to nothing but gazing at Bolli and his grandeur, and that of his followers." Anglo-Saxon & Celtic Orthodoxy is about the Orthodoxy of The British Isles, Low Countries and parts of France, Scandinavia in the first millennium.